Gynaecologist tested. Instantly relieves vaginal dryness. Relieves and replenishes dry uncomfortable skin. With ProHydrate complex. Feels like your own natural moisture. Easy to use flip-top cap. You can have the most loving relationship, but if you experience vaginal dryness, what starts as a dryness problem can become a relationship problem. 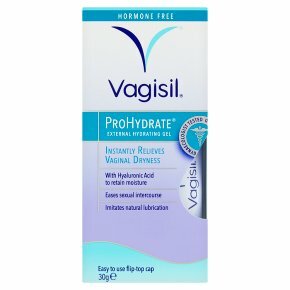 Vagisil® External Hydrating Gel relieves and replenishes dry, uncomfortable vaginal skin to make intimacy more comfortable. Leaves intimate skin feeling hydrated, supple and more comfortable. Contains ProHydrate® Complex - a unique blend of moisturisers, including Hyaluronic Acid, which feels like your own natural moisture. Progressive use can make your intimate skin feel healthier. Formulated without added Estrogens or Parabens. Hypoallergenic. Directions: Use as needed to relieve and replenish dry, uncomfortable vaginal skin and as part of a regular intimate care routine. Tamper resistant tube. Do not use if the tube's seal is missing or broken. Tear seal to open.<br>Compatible with natural rubber latex and polyisoprene condoms.<br><br>CAUTIONS:<br>This is not a spermicide and does not provide protection against pregnancy.<br>Keep out of reach of children.<br>If vaginal irritation occurs, discontinue use. If symptoms persist, contact your healthcare provider.<br>If pregnant or breast-feeding, consult your healthcare provider before use.